This recipe is one that captures memories of sugar-high mornings spent stuffed in a crowded elementary school cafeteria, or snuggled into the couch watching Saturday morning cartoons. I wanted to bring back a treat that was simple and able to be elevated without ditching its super-sweet, whimsical charm. 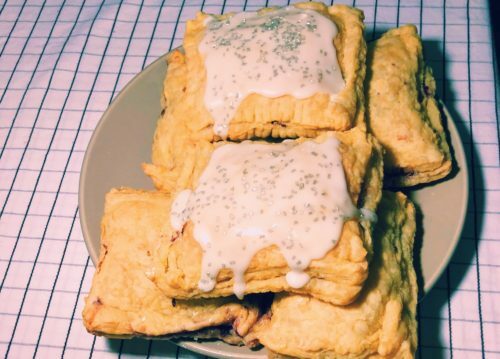 These mixed berry pop tarts are a special little nod to Frosted Strawberry Pop Tarts™ but with a homemade “grown-up” flair. CLEAN your berries by rinsing them under cold water and checking them for any stems. ADD the berries to a medium saucepan with the lemon juice and about 3 tablespoons of water, and mash them together to a smooth consistency (chunky is good too!). COOK the mixture on medium-heat rolling boil, stirring occasionally to keep it cooking evenly, for about 5-6 minutes, or until it can coat the back of a spoon. REMOVE the jam from heat and transfer to a glass bowl until it cools to room temperature. This recipe makes a bit of extra homemade jam, and you can keep it chilled in the refrigerator to spread on your favorite breads and pastries! ALLOW the puff pastry to come to room temperature before placing one sheet onto a floured surface, and rolling out into a slightly thinner rectangle, about an extra inch on each side. CUT the puff pastry sheet into six even rectangles. SPOON about one tablespoon of jam to the center of one rectangle, and spread until there is about ½ inch on all sides. PLACE another rectangle of puff pastry on top (two rectangles = one tart). PINCH AND ROLL the sides of the puff pastry over one another, to keep them from bursting in the oven. SEAL them again by pressing a fork down on all sides, and poke the top in four places to allow steam to come out, and once again, keep them from popping open. REPEAT with the remaining puff pastry and jam. TRANSFER the tarts to a non-stick baking sheet with either parchment paper or small amount of non-stick baking spray. BAKE the tarts for 15-20 minutes, or until the tops are light to golden brown. REMOVE the tarts from the hot pan immediately, and place them on a cooling rack or tray. STIR the powdered sugar with about 2 tablespoons of water at a time, mixing to make a frosting that is thick and smooth (drizzle-able), but not runny. SPOON the frosting onto the tarts, either a lot or a little, depending on your sweet tooth. OPTIONALLY GARNISH with sprinkles or more powdered sugar.